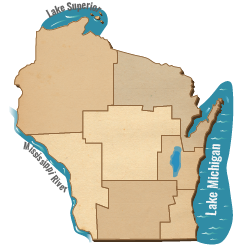 Get inspired for your next Wisconsin vacation and find yourself in a state of fun! Natural Wonders Calling all adventurers. You’ll be amazed at the fun you’ll find as you explore the scenic wonders of Wisconsin. City Getaways Plan your kind of city getaway with urban skylines and charming neighborhoods, waterfront restaurants and lakeside museums. Hidden Gems In charming small towns and historic city neighborhoods, uncover must-see places locals love on your next trip to Wisconsin. Family Getaways Plan a vacation the whole family will love and make your own let’s-do-it again memories to share for generations. Romantic Getaways Everyone needs a little together time now and then. From luxury spas to a secluded spot for a candlelit dinner, you'll recapture the romance with a Wisconsin getaway. Summer Getaways Deciding where to go is easy when you check out these summer destinations. Whether you have 48 hours or a week, we've got a getaway for that. Music Festivals Whether you love to listen to rock, blues or country, rising star to big-name musicians, Wisconsin has a music festival for that. Girlfriend Getaways Girls night out just got better. Plan to getaway for some bonding time with lots of laughs, smiles and adventures. You know you deserve it! Guys Getaways Kick back and catch up. Plan a Wisconsin trip with the guys where you’ll find outdoor adventure and hearty grub or city fun and top shelf drinks. Pets Welcome No need to leave your best pal at home. Find spots that help pets and their people have a doggone good time. Frank Lloyd Wright You’ll be inspired exploring the work of this world-renowned architect as you travel across southern Wisconsin. Fall Getaways As the fall color road show begins, plan your getaway to picture perfect spots for leaf looking adventure and colorful destinations for a taste of fall fun. Winter Getaways Winter getaways mean snow covered trails, fun filled resorts and cozy diners. Start your planning and sing it with us . . . let it snow, let it snow, let it snow! Spring Getaways Spring may have sprung so grab your bike, paddle or binoculars and head outside for some fun.